Your family doctor suggests an improved nutrition plan for your family: Purchase your favorite boxed cereal (labeled 100% complete), and eat it 3 meals/day the rest of your life, with no milk, only a glass of fresh water on the side. RIDICULOUS? You would not follow this advice, yet our pets follow this diet every day. Before dog food was available, we know that dogs ate table scraps and various "goodies" they could find around the farm. It was normal for dogs to live 15+ years. (Keep in mind that daily exercise also contributed to their longevity). In today's busy society, it is necessary to provide a healthy alternative to home-prepared food. There are many high-quality dry foods available that use only the finest ingredients with no by-products, chemical preservatives, cheap grain product, rendered meats, artificial colors, or artificial flavors. Not all processed foods are created equal. Read your labels. We have done the research. We provide only the highest quality foods. 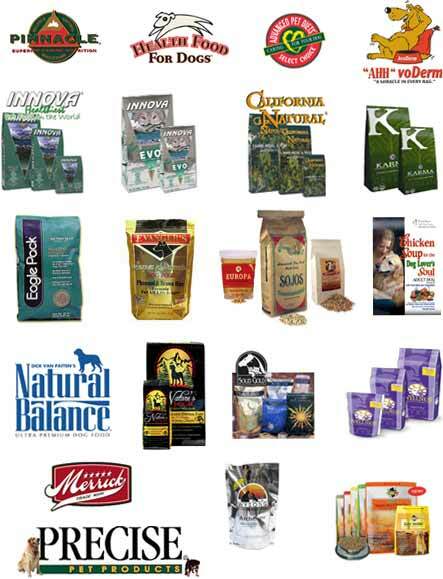 Here are the links to some of the dog food brands we stock.